The biggest banks often charge the highest credit card interest rates. We compare rates from CBA, NAB, ANZ, Westpac and more to find the best deal. MORE than one in six Aussies have succumbed to the “debt trap” that is credit cards, the Australian Securities and Investments Commission (ASIC) has revealed. I wonder how accurate these stats are? are these figures (aggregated) reportable by the banks? I wonder how accurate these stats are? What is the stat actually measuring? It would be useful to report how many credit card accounts as a percentage of the total are not paid off in full by the due date each month, and the average balance owing that is then subject to interest? That might even reveal how much the banks are taking in from credit card debt in real money. And how many of us are at risk. An increasing trend in $ and or percentage would not be good. Unfortunately it is an increasing number, and overall Aussies carry a lot of credit card debt. The numbers come from the RBA, so hopefully it’s pretty accurate. The same data indicates most people carry debt on cards with higher interest rates, so we could save a lot by switching. Anecdotally, I’ve also heard that credit cards packaged with other products like home loans are a barrier to making changes, for some people at least. American Express - great $0 fee & 9% interest - but I see the notices at shops & fuel bowsers - indicating a charge of 2% or 2.5% for their use. Not so great. In addition to the higher fees it is not welcomed at nearly as many businesses as Visa and MC. I feel that we as Australians overuse our Credit Cards. How many of us have 2-3 cards in our wallet. Some are attached to our debit cards and many times we move payments around. If you get payed monthly and don’t use your card properly by the time you get paid again half of it goes to pay off the card. I have a no annual fee credit card, I have used the same one for years and when it is time to renew the card they inform us that we have to pay an annual fee we just tell them to cancel the card. So far we have not had to pay a fee. How many of us have 2-3 cards in our wallet. 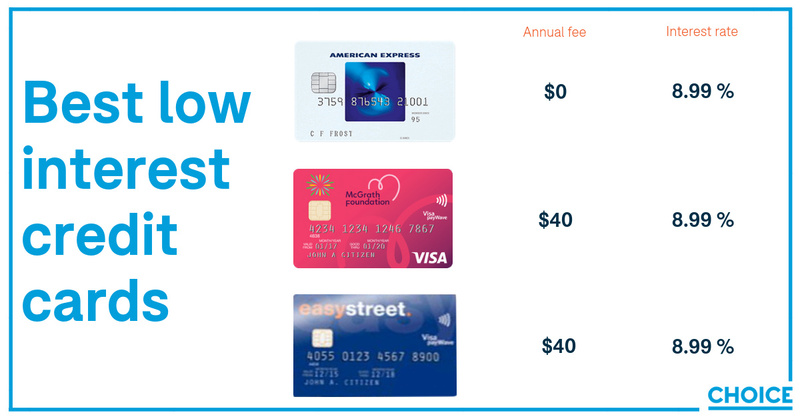 Multiple cards (credit as well as debit matter), including no cost low fee ones seem just part of the mix unless you are a cash only customer and not worried about carrying a few $100 all the time. Our low-interest credit cards article is updated, including some info on cards with 0% balance transfers. I have two credit cards in my wallet. In the last 10 years, I have twice had to have a card replaced due to fraudulent transactions. The thought of being on a trip outside of Australia, and having a card rendered unusable, is the main reason I carry more than one.